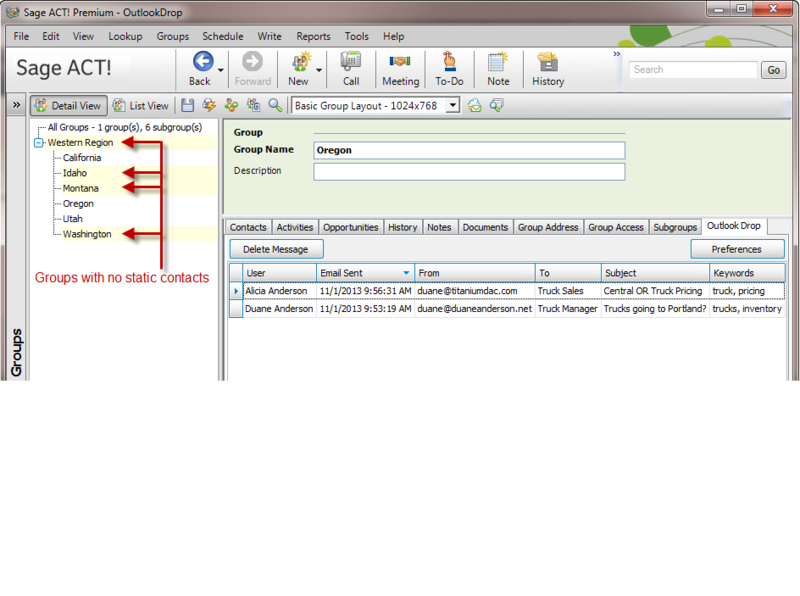 How would you like to drag incoming Outlook emails directly to a Contact, Group/Project, Company or Opportunity in Act! so they’re available to anyone using Act!? Then Outlook Drop is for you! Effortlessly drag your emails to one of the entities in Act! and have it available to anyone in your organisation using Act!. 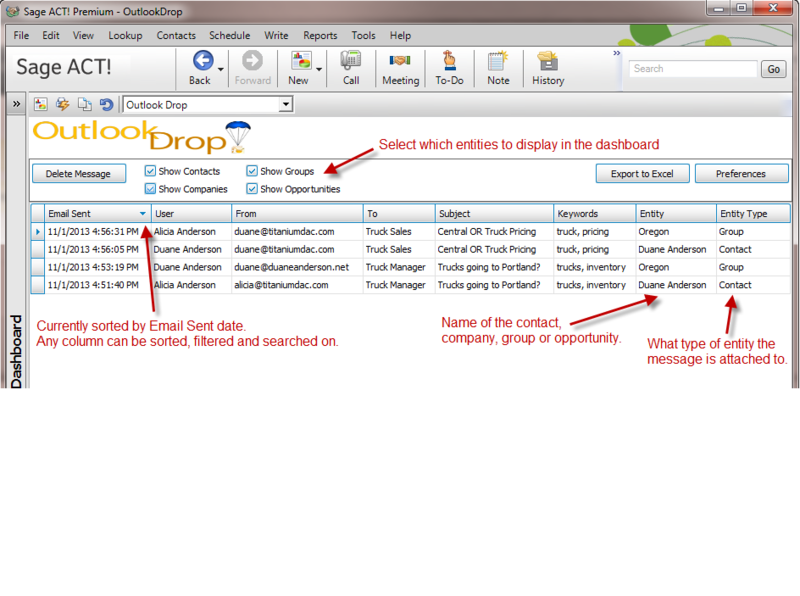 Outlook Drop starts by adding an Outlook Drop tab to your contact, company, group and opportunity detail views. Then, for the company and group detail views, it replaces the old Act! tree list views with an enhanced tree list with a few extra options. The first two additions to the tree list are on the right-click menus. Expand All and Collapse All were added making it easier to expand your entire list for easier viewing, or collapse it back down again. We’ve also added more text to the menu options making it easier to understand what each option does. There’s also an option to attach to your files to the documents tab and not bury them in history like Act! does. But wait! You can add a document simply by dragging it directly to the group or company name right in the tree list! How easy is that!!! 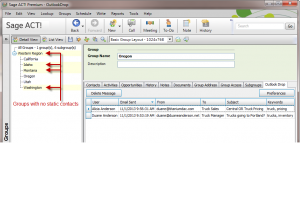 And of course, you can drag your Outlook emails directly to the company or group name in the tree list which will automatically add it to the Outlook Drop tab. How would you like to see which companies or groups don’t have any static contacts assigned to them? 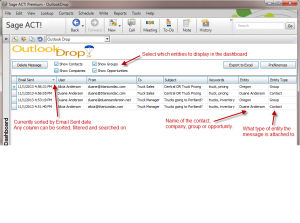 Outlook Drop can show you! Just enable the option in preferences and all of your companies or groups will now be highlighted showing which ones don’t have static contacts! How cool is that? 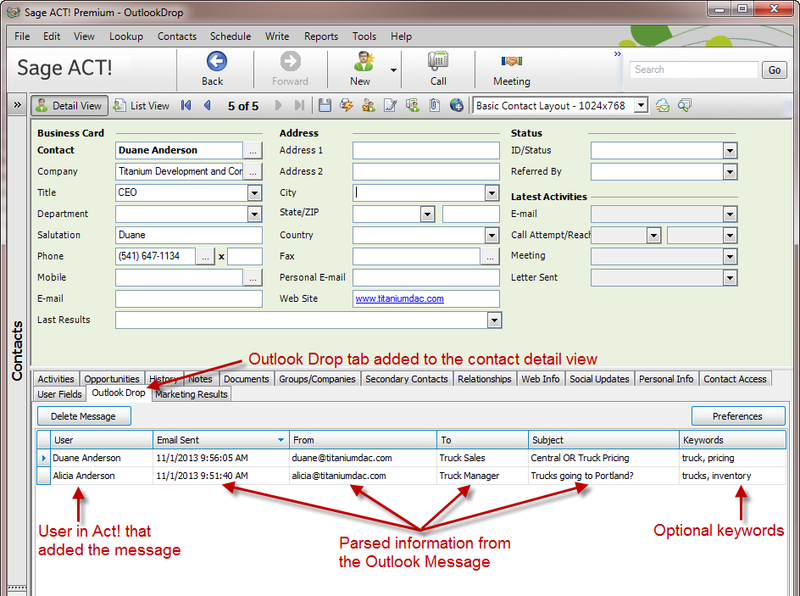 Outlook Drop doesn’t just attach your email message to Act!, it actually parses the header and text body of the email! The Send Date, From, To, Subject and Body are all stored in a custom table in Act! so that you can search for it later. And we didn’t stop there! You can also set an option to prompt for keywords. All of the fields are searchable, so if you have emails spread across different entities in Act!, you’ll be able to find those messages without a problem. In addition to the Outlook Drop tabs for each of the 4 main entities, there’s also a dashboard view of all the messages stored in Act! Filter, sort or search by any of the fields in the view. You can also export the current view to Excel. Pretty cool stuff here! Pricing for Outlook Drop is $99 for the first license, subsequent licenses are $49~. 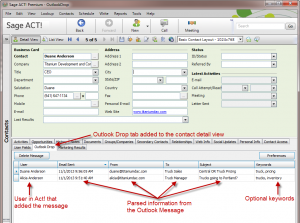 Each user needing access to the Outlook Drop information requires a license.